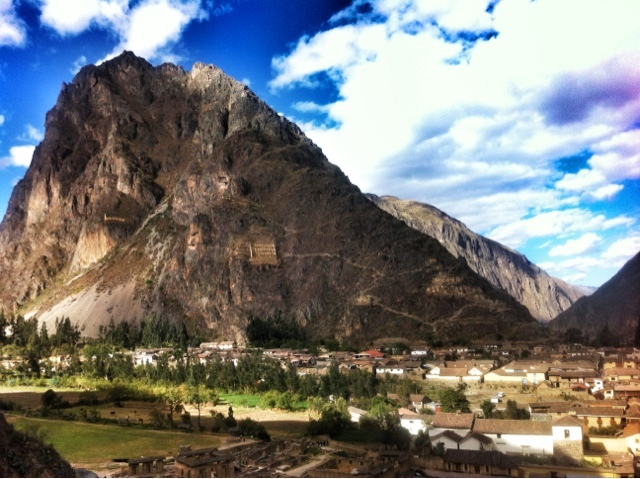 The Sacred Valley of the Incas is a collection of cities that are home to various Inca ruins. It is located in the Andes, within the Cuzco region. 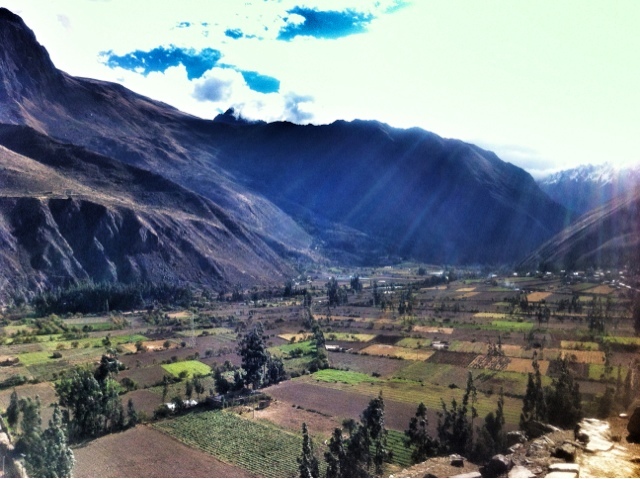 For 35 soles, I was up and ready in a Sacred Valley tour bus at 8:30 in the morning. With no heat on the bus and the temperature in the 30's, we were all basically relying on our collective body heat to warm up the bus. We drove for a couple hours outside of Cuzco to the Inca town of Pisac, where we had to purchase a ticket to enter the various Sacred Valley sites. A partial ticket cost 70 soles, allowing entrance to four (Moray, Pisac, Chinchero, and Ollantaytambo) of the Sacred Valley sites. 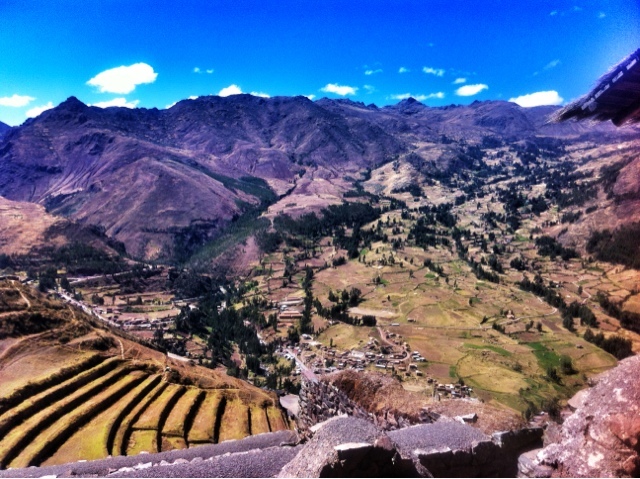 In Pisac we climbed the steps leading up to the granaries, where the winds picked up strength and kept the food that was once stored there dry. Visible along the mountainside are large holes that served as the Inca cemetery. When a king died, his body was mummified, and apparently many people sacrificed themselves so they could follow their king in the afterlife. That's loyalty. Afterwards, we stopped by colonial Pisac, where we got dropped off at pretty much a tourist market. 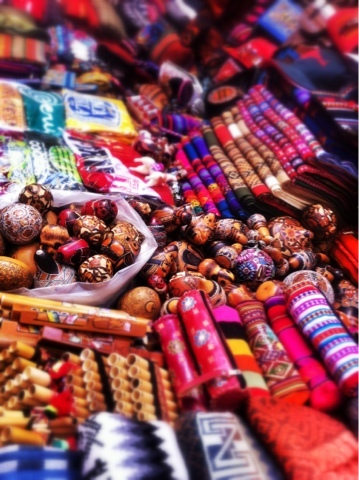 Hundreds of stalls were filled with alpaca clothing, blankets, and other trinkets. We didn't stay for long before heading to another town for lunch. 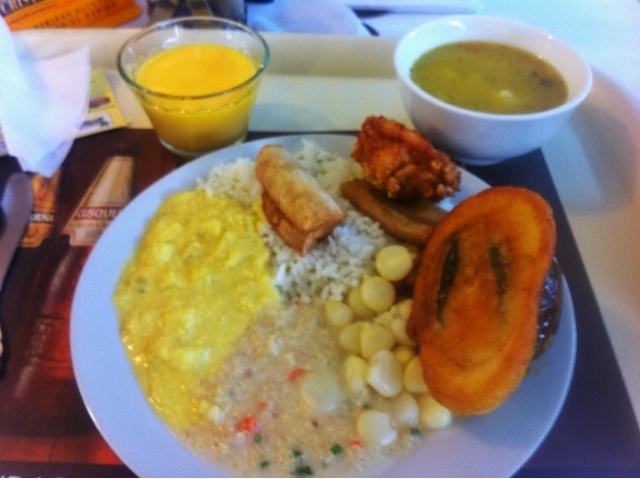 There wasn't an alternative restaurant to the one the bus dropped us off at, so I caved and went with the tour's buffet - alpaca, chicken, beans, corn, soup, orange sponge cake, and some jello like dessert. Post lunch, we headed towards Ollantaytambo, where the ancient Inca terraces were once used not for agriculture, but for flowers. Then, it was another hour of rolling hills of various shades of brown until we would get to Chinchero, located approximately 300-400 meters above Cuzco. 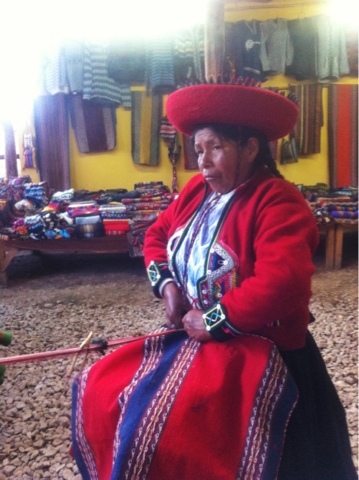 We got the opportunity to see a co-op demonstrate how the women there use natural plants to produce organic dyes for coloring the various alpaca clothing they weave. We then walked a couple blocks up to the Chinchero museum, where the guard was apparently drunk and so the museum was closed. As each of us returned to the bus at the bottom of the hill, I made another stop at the co-op where we had just seen the demonstration. I walked in just as one of the co-op employees was giving our guide money - presumably a cut of what they made from our tour group. Awkward. 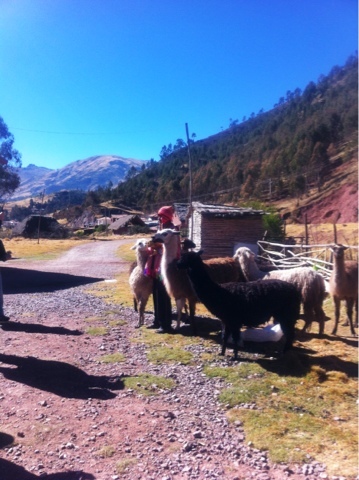 The rest of my time in Cuzco went by too quickly, and, not surprisingly for those who know me, was spent on food. 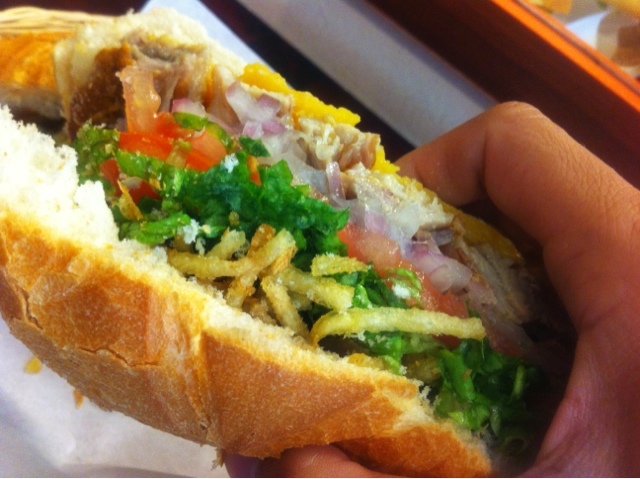 Lunch or dinner sometimes consisted of pork chicharrone with carrots, onions, potato (over 3,000 types are grown in Peru), and mint. 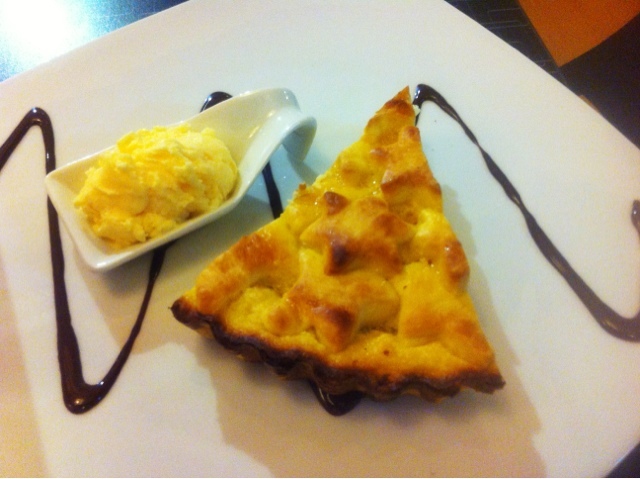 At Momouth Cafe, I had an amazing pie of the day (some type of fruit) with an equally amazing scoop of ice cream - all paired with a glass of hot chocolate. All of that was followed by a filet fish sandwich, which apparently was just a tuna sandwich. At least I had already filled up on dessert first. Music from the Beatles, Bob Dylan, Bob Marley, and other classics filled up the background. It was the night before my trek on the Inca Trail to Machu Picchu. Llama Path, the tour company, was holding an hour briefing on the logistics. There, the fifteen of us - Ellen, Carey, Judy, and Lisa from Wisconsin, Eric from Minnesota, Shelly from California, Liz and Michael from Canada, Mark and Sophie from the UK, Sheenay (sp), Jenny, Jackie, and Chris from Australia - were offered coca tea and told we would be leaving at 4:30AM the next morning! 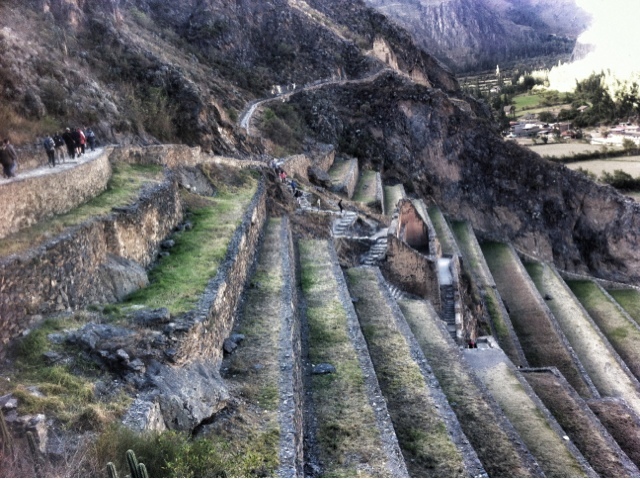 Next up, four days and three nights on the Inca Trail to Machu Picchu and a race up Wayna Picchu.